Post-war America often was cited as a shining beacon of freedom, tolerance and understanding, but casual (and not so casual) anti-Semitism still regularly occurred, not to mention racism and other societal ills. 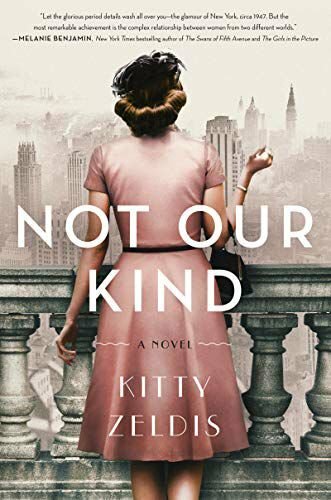 And that current is an underlying theme in “Not Our Kind,” a novel by the pseudonymous Brooklyn, N.Y.-based Kitty Zeldis. It’s not clear why the author is hiding her identity because her work is certainly praiseworthy. “Not Our Kind” follows the life of Eleanor Moskowitz, a Vassar graduate in search of a job. Eleanor had taught at an elite private school, but ran into trouble when she failed a top student for plagiarism. When the student’s wealthy parents protested, Eleanor was allowed to resign. About the same time, the cab Eleanor’s riding in collides with another cab. The well-to-do passenger in the other cab, Patricia Bellamy, takes the bleeding Eleanor home to tend to her minor wounds. There she meets Margaux, Patricia’s 13-year-old daughter, who is dealing with polio. The combination of Margaux’s age and anger over the disease has prompted her tutor to quit. Upon learning that Eleanor is Jewish, Margaux immediately tests her, asking her about why Jews killed Christ (as her Sunday school teacher had said). Eleanor explains in detail why that wasn’t true, impressing the young girl with both the answer and her calm demeanor. Patricia hires Eleanor, who has to conceal that she’s Jewish because the Bellamy family lives in a restricted building. The arrangement proves beneficial, as she and Margaux bond.